As part of the first phase of a £1.5 million investment programme, Concentric Pumps Limited has installed two new horizontal machining centres to cope with increased demand for diesel engine fuel pumps at its UK plant in Birmingham. 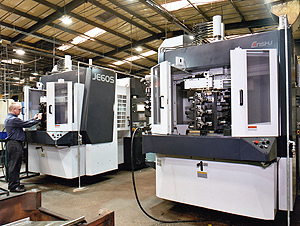 The total investment of £0.5 million encompassed a full turnkey system including two new Enshu JE60S 2APC horizontal machining centres, designed for multiple operations on prismatic parts. These are "full process", high performance traveling-column machining centers, representing the state-of-the-art in the latest generation of machines and offering extremely high quality and efficiency. Features include rapid traverse rates, advanced design spindle, fast two-pallet shuttle system and large capacity tool storage. Paul Moseley, Concentric's Programme Manager, commented: "The two new Enshu machines reflect our policy of continuous investment in the latest and most advanced production facilities. They will help to ensure that Concentric produces pumps of the highest quality, accuracy and efficiency in line with customer demands." Maximum spindle speed of the JE60S is 13,000 RPM with a BT40 tool shank and oil/air lubrication or 20,000 RPM with a hybrid spindle cooling system. The table measures 500mm x 500mm table and has a maximum capacity of 600mm cube. Non-cutting time is kept to a minimum by the 50m/min rapid traverse rates and one second tool-to-tool change time, 3.1 second chip to chip time. Positioning accuracy of 0.002mm/full stroke and repeatability of +/- 0.001mm ensure very high standards of accuracy. The machines were supplied to Concentric by Yuasa Warwick Machinery Limited, which specializes in the supply of Japanese CNC machine tools and work-holding equipment. Concentric Pumps Limited is a subsidiary of Concentric plc, a major supplier to the world's, truck and construction equipment industries with production facilities in the USA, India and China as well as the UK. In addition to oil and water pumps for diesel engines, the company also manufactures lubrication pumps for transmissions and compressors.